The ARC CEED 2017 Annual Report. 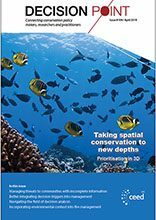 CEED has a fantastic record of cutting-edge research and publication, and this work will have enduring impact. However, one our greatest legacies will be our people, and in particular our postgraduate students and post-doctoral fellows – our Alumni. Our well-connected network of Alumni (self-identified as CEEDlings) now spans the globe, and is making an enormous contribution to improved environmental decision-making and biodiversity conservation in a variety of ways. If you want to see examples, now you can read their stories. We are profiling a selection of Alumni stories in this and future issues of Decision Point. They are also featured in our brand new (2017) Annual Report. And, because we want all readers of this year’s Annual Report to take notice of our Alumni, these stories aren’t buried away in the appendices at the back. No, we’ve gone for the big splash approach and featured our Alumni network across a glorious full-colour, fold-out gatefold. You can’t miss it, because we want the world to notice these people and their stories. The gatefold inside the Annual Report, featuring Alumni stories. The gatefold also contains some of the preliminary findings of our impact-evaluation exercise (another piece of CEED work we don’t want people to miss). The evaluation of CEED’s impact is still a work in progress (see Decision Point #102), but our findings so far suggest CEED has a strong story to tell. But it’s not just our story that’s important here. Our development and trialing of an approach to evaluate a Centre of Excellence will be yet another legacy of the Australian government’s investment in the Centre-of-Excellence program; a program like none other in the world, and the foundation of Australia’s academic leadership in the biological sciences. 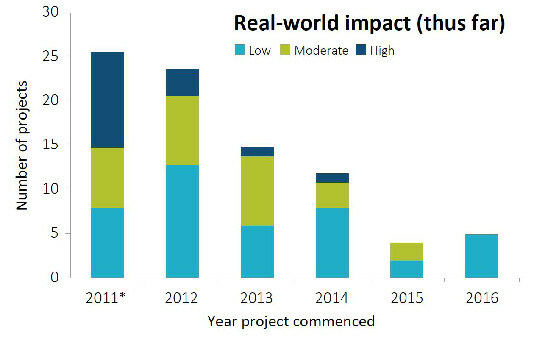 Figure 1: CEED research projects were ranked on impact. (*Nine projects that started before 2011 under other funding sources.) This figure appears in the gatefold of the new CEED 2017 Annual Report. 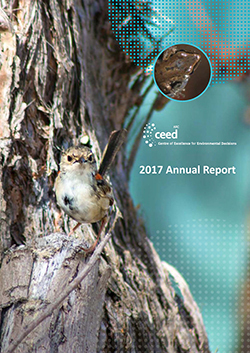 If you’d like to download your own copy of the Annual Report, please visit our CEED website. Our approach to the impact analysis has been to evaluate the social and environmental impacts occurring from the interdisciplinary research produced by members, partners and associates of CEED. A set of criteria was developed to measure the initial impact of affecting change, such as the extent to which the research attributed to a change in policy, an improvement in decision making processes or an improvement in management practices. The amount of collaboration, engagement and knowledge transfer activities were also considered. Traditional academic metrics were also analysed to provide a supportive context to the claims of impact, and we are benchmarking CEED against other similar Centres and networks. The findings so far reveal that CEED has achieved a very high level of academic impact and currently has a growing influence on public policy and management practices. We can see from our analysis the time lag often reported between results from research being made available to the contribution to a policy change. Figure 1 demonstrates that the projects commencing at the inception of CEED have achieved far greater impact than those recently commenced. In a sense, this also applies to our Alumni. As they mature into seasoned researchers, their impact will continue to grow. For they are really the seeds of CEED.